My parents were blessed (Or should I say cursed?) with three children, so they’re old pros when it comes to handling the “monkey stuff.” We never terrorized them to the extent that the Warners could’ve, but those kids were definitely our idols. I even told people that the Warners would stay in our town’s “Tin Man” style water tower when they wanted to check up on us. I actually believed it too and would wave to the tower every morning and afternoon. With my intense love of the Warners, it’s only natural I’d want to eat like them. And what could be better than stuffing yourself with 501 meatballs? Especially in Sweden, the actual home of meatballs and Volvos! Although, Wakko didn’t look like he was having too much fun. Becoming living-impaired does kind of put a damper on things. That and being pushed and insulted by your brother and sister. (“Slopface?”) I totally get it. I’m the middle child too. Still, gorging on meatballs had to be fun until at least meatball number 450. And if the Grim Reaper’s going to get you anyway, I can’t think of a better visual than him rising out of a tub of meatballs. Recipe makes 34 meatballs. Over 500 is a bit excessive. Melt 1 tablespoon of butter in a large pan. Add onions and garlic and sauté until onions are soft. Remove from heat and set aside. In a large bowl, combine panko-milk mixture, beef, pork, eggs, onion and garlic, salt, black pepper, allspice, and nutmeg. Mix until just combined. Scoop out meat mixture the size of two tablespoons and place on a baking sheet. If using a scale, each meatball should be about 1.4 ounces. Form meatballs into rounds and chill for an hour to help the balls maintain their shapes while cooking. Melt the remaining two tablespoons of butter in a large pan over medium-low heat. Add the meatballs and cook until brown on all sides, about 10-15 minutes. 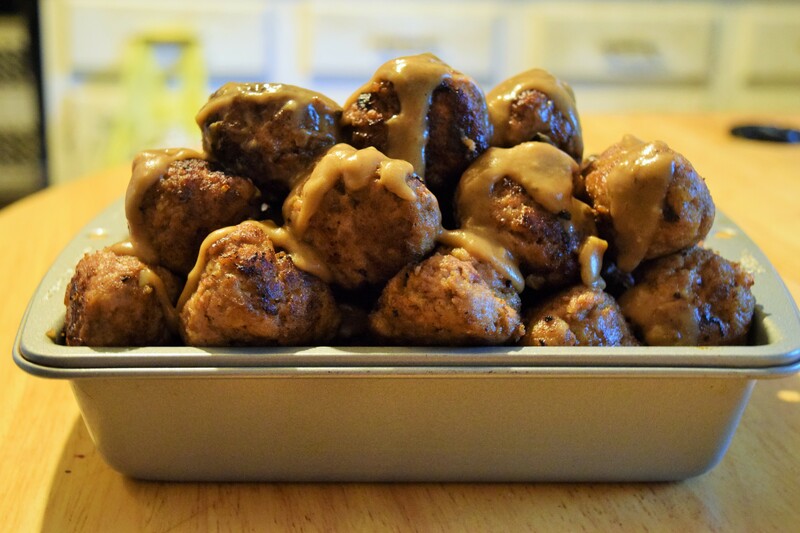 Move the meatballs to an ovenproof dish and place in oven to keep warm. If I didn’t know better, I would challenge someone to a meatball eating contest. Oh, who am I trying to kid? My sibs and I have been challenging each other to all sorts of contests for years. Just like the Warners, we do consider ourselves like a set of chess pieces from The Franklin Mint. No matter what stupid things we say and do, we’re still family and would do anything for one another. Even face Death himself.